The Rand McNally TripMaker RVND 5510 manages to combine versatility with convenience, all the while avoiding to break a buyer’s budget. The unit comes with all the features an RV driver might ever be looking for. Furthermore, the user interface is easy to learn and customize, which is why this model has been praised for its efficiency right after it has been taken out of the box. The voice function provides accurate info regarding secondary turns. Some of the consumer reviews we have analyzed emphasize that the graphics of this alternative might seem more or less basic compared to other products in the line. Granted, the Rand McNally TripMaker RVND 5510 does not come with the capabilities of a Garmin or Magellan model, but the backlit display shows the routes and other info as accurately as possible. Various buyers have complained about the colors of the touch screen when it is placed in direct sunlight. However, even these users state that this is not a deal-breaker, as the RV GPS navigator should after all be used in a vehicle. Gone are the days of 4-inch navigators. Sure, the Rand McNally TripMaker RVND 5510 might not compare to its 7-inch counterparts, but the 5-inch screen size is the perfect choice for people who don’t require a very wide screen. One of the reasons this model is among the most inexpensive yet perfectly capable ones on the market today is the screen size. Rand McNally programmers have realized that 5 inches are more than enough when it comes to displaying info regarding the actual route, the town one is transiting, and the speed limit. Both the time and the distance left until reaching the destination are exhibited in the corner of the screen. 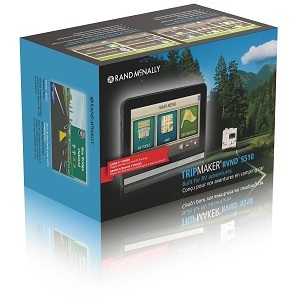 Unlike other RV GPS navigators we have analyzed, the Rand McNally TripMaker RVND 5510 has been specifically designed for RVs. RV-easy routing is a core feature of this alternative, as the users have the opportunity to customize it according to the exact vehicle model they are driving. This allows them to save a lot of time which would otherwise have been spent on finding and choosing other routes. The fact of the matter is that this navigator automatically adjusts one’s course according to the user custom configuration. 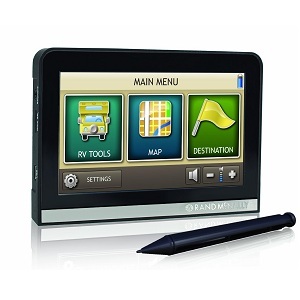 As is the case with other Rand McNally devices, this one comes with RV amenities, tools, trips and special content. More than 14 million points of interest are available in the user interface, along with parking, campsites, dump stations and showers. In addition, the unit can turn a boring trip into a fun experience, as it contains data about scenic tours, weekend getaways, beaches, and even animal hospitals. While most models which are capable of an excellent performance usually cost around four to five hundred dollars, the Rand McNally TripMaker RVND 5510 can be found at a much fairer price. If you are unsure about the characteristics of this alternative and would like to avoid spending a large sum of money on the same unit by getting it from a specialized shop, our advice to you is to first test it out and then buy it online. A variety of online marketplaces sells it for around three hundred and fifty dollars, and Amazon customers can greatly benefit from the retailer’s sale discounts.